Hear what’s being said – even on the other side of the room. Don’t let your hearing loss limit your enjoyment at restaurants, college classes, community get-togethers family functions or business events. No matter if the speaker is on the other end of the table or the other side of the room, the ReSound Micro Mic can help you hear sounds you want to hear. It’s Smart Hearing at its best! The ReSound Micro Mic hearing aid microphone lets you hear from a distance up to 80 feet away* without having to wear an extra device around your neck. Just hand the matchbox-sized ReSound Micro Mic to the person whose voice you want to hear. They can clip it on their clothes or wear it around their neck on a lanyard. The ReSound Micro Mic lets you stream sound from whatever direction you please. Whether it’s towards the person across from you at the dinner table or kids sitting in the back seat of your car, their voice will be streamed right to your hearing aid. This way you can feel confident that you won’t miss out on what is being said when you’re out with family or friends. 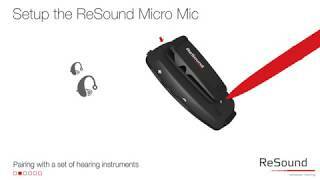 The ReSound Micro Mic is easy to pair and use. 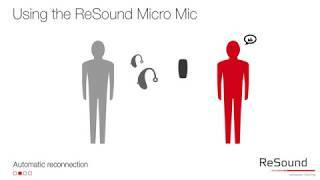 A hearing care professional can tell you more about the ReSound Micro Mic.